In this post I’ll explain in an easy step by step tutorial how to install Apache Flex 4.8.0 in Flash Builder, I know that it’s not rocket science but maybe newbie developers could need more information to start play with new SDK. The new SDK is more or less the same of 4.6 but under Apache flag, like you can read at Spoon website, but we hope people behind the project could give us new opportunities for our RIAs and Mobile projects. First of all download Apache Flex 4.8.0 binaries for your operating system (in my case OS X), keep attention, you need the binaries release not the source one. 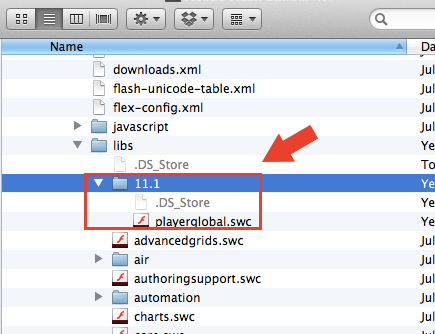 Then download playerglobal.swc for Flash Player 11 on Adobe website. 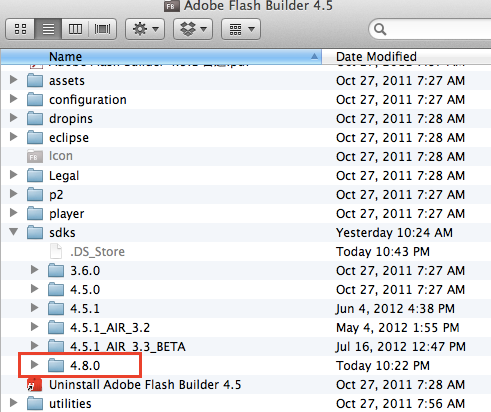 Save it in /Applications/Adobe Flash Builder 4.5/sdks/4.8.0/frameworks/libs (it could be better create a folder called “player” or as you want, in my case I use “11.1” and save the swc inside). Then you can start to enjoy the new Flex SDK. 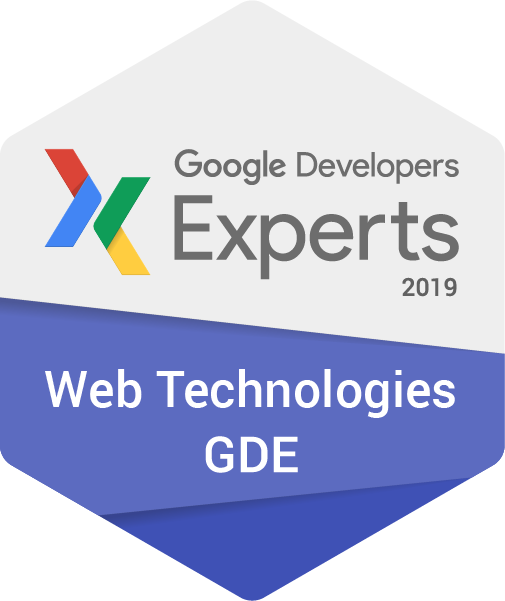 The team behind Flex in Apache is working on a new AIR application that will help you to install in Flash Builder the SDK but it’s not released yet… we hope to have it soon, in the meanwhile I hope this tutorial could help you to set your IDE. If I forgot some steps in my description please comment to this post to help everybody to enjoy Apache Flex, thank you in advance. I’m working in a new project where we have to automate the integration of fonts loaded on a server by users and integrate them in a Flash / AIR project. Searching well you can also find a solution with swfmill but there are some problems to integrate with AS3 projects. Like you know, in my spare time, I’m playing with Haxe and Corona SDK and in this case Haxe help me to accomplish my task. I found a great library called hxswfl made with Haxe that allow me to create a swf or swc file directly from an XML, there are many other usage of this library that are described on online repository of this project, but what I need this time is use it to create a library with embedded fonts inside with a class name assigned to each font. Any node has 2 attribute, file attribute where I set the path to find my font on filesystem and the class where I set the class name of my font that I’ll use in my actionscript class later. I’m telling to my neko program that it has to convert my xml to a swf library, embedding inside all fonts described in the XML file with that class name. Now we have our SWF file with fonts, we can create our Actionscript project and load with a loader object our swf file. 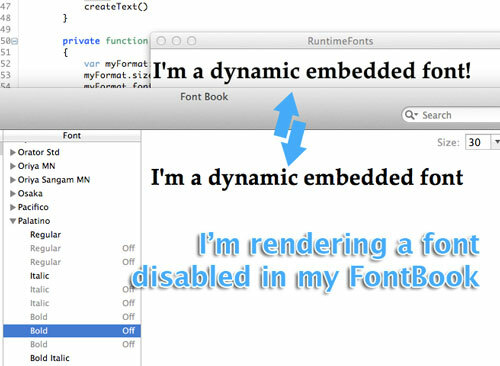 Ok, now you can use any fonts that you have in your SWF without install them in your laptop and without create any AS3 class, this is a really easy way to work with external fonts in a dynamic way. Obviously I prepare a sample to download if you have any questions feel free to leave me a message to this post. It’s not finished yet, because I’ve a question for you: what happens if I use the same technique for different devices? 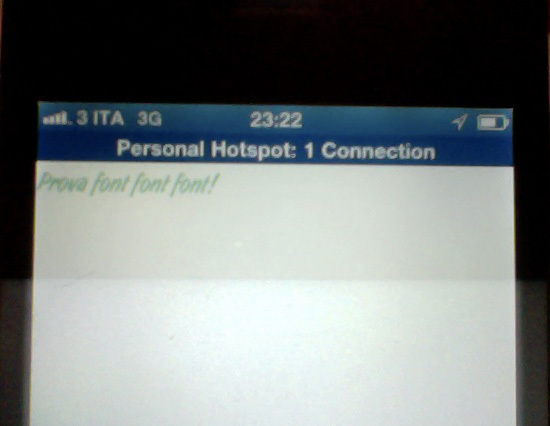 On web and desktop (AIR application) there are any problem because I can load any external SWF file, the same on Android and Playbook but on iOS? With iOS you can a SWC file instead a SWF file so your SWC library will be embedded at compile time in your application for iOS and you can access to fonts more easily instantiate directly your class name. For more information about this technique I suggest to read this article on Adobe DevNet.